Google Drive review, looking at the popular backup service's pricing, features, security, customer support and ease of use. Google Drive has lots of strengths, particularly for users looking to create new content online. Poor security is likely to cause concerns for privacy-conscious users, but its convenience, ease of use and excellent facilities for collaborative working make it deserving of its success. You can read a detailed review below or sign up now. Google Drive has online backup plans to suit every need – from a free 15GB subscription all the way up to 30TB for $299.99 per month. The idea is that you’ll start small and then gradually increase your Cloud storage allowance as the number of files you’re backing up grows, so in between you’ll also find 100GB for a monthly fee of $1.99, 1TB for $9.99, 10TB for $99.99 and 20TB for $199.99. These prices (especially for smaller plans) are extremely competitive, and the 15GB free backup allowance is much higher than average, making Google Drive an appealing product for users with smaller quantities of data. Business users also have the option to sign up to Google for Work, which is designed for corporate clients, with unlimited* storage space on offer as well as additional user management settings and round the clock customer support. Business accounts are priced at just $10 per month per user, or you can give it a trial run by signing up for a free 30-day trial. Payment for all subscriptions can be made using Visa, MasterCard and American Express. * Business accounts with less than five users are limited to 1TB of space per user. Google Drive began life in 2005 as Writely, an online word-processing service created by software company Upstartle, which was purchased by Google in 2006. Renamed and re-branded, it was relaunched as Google Docs to a limited audience in 2007, and to the general public in 2009. In 2012, it officially became known as Google Drive, incorporating not just Docs, but also Sheets and Slides, as well as offering both free and paid online data storage. Today, Google Drive is used by over 250 million people around the world, with an ever-expanding selection of new Apps and add-ons increasing its functionality and appeal. Google Drive is a form of Cloud Storage, meaning that its main focus is on file sharing, rather than storing large quantities of files. It also facilitates both the creation of new documents in native Google applications such as Google Docs, Google Sheets and Google Slides, as well as the storage of externally-created files. It also gives users the option to edit existing documents, work collaboratively on group projects, and sync and share their files. Unsurprisingly given Google’s overarching commitment to the maximum integration of all of their services, you can use a single Google Drive account to backup and create files from an unlimited number of devices. Backing up data with Google Drive is just a matter of uploading files or folders to their website, or downloading the Drive client and adding documents to the folder it creates on your desktop. It’s all very easy and intuitive to use, although storage limits prevent it from being the best option for doing a full backup of all of your files. There is a way to get around these restrictions, however, as no files created in native Google formats count towards your storage quota. This exemption also extends to videos of under 15 minutes and images of less than 2048 x 2048 pixels that are saved in Google+ Photos, and also to any files created in other programs but converted to Google Drive formats. This means that if you don’t mind the extra work, you can get a lot of mileage out of a free plan. In theory, this sounds pretty exciting, as Google are effectively offering unlimited storage space for free. However, if you don’t have the time or patience to transfer everything over to a new format, or if you have any qualms about Google’s monopolization of the internet, it might not be quite as good a deal as it sounds. Google Drive can be used with Windows and Mac operating systems, or mounted to a Linux file system – although there is no official Linux client at present. Drive is also automatically integrated into Chromebooks, and mobile users can access it from both iOS and Android devices. Sharing files is easy with Drive – all you need to do is open the document from your online account, then choose to either share it directly by entering an email address, or generate a link to post or send anywhere you like. Both options give you a choice of three permissions – read only, comment only, or full editing. If you choose to give your recipients free rein over shared files, they’ll be able to edit them in real time, and see all changes as they are made. The versioning history of files saved in proprietary Google formats is unlimited when using Drive – meaning that you can access previous drafts of your documents even after they have been replaced with more up-to-date versions. Non-Google files are subject to more restrictions – a maximum of 200 versions can be kept for 30 days, although the default setting only retains 100. Any files or folders that you remove from Google Drive will be transferred to a recycle bin much like the one on your desktop. There’s no time limit on how long they can stay there – just delete them permanently when you’re confident that it’s time for them to go. Google Drive users can also save attachments directly from Gmail, simply by hovering over the email’s them and selecting the Drive logo. A useful bit of integration, this is great if you’re using Drive for work, as it saves you the bother of downloading, saving and then re-uploading any email attachments that you want to backup. As previously mentioned, Google Drive is not just a Cloud storage provider, but also a place to create new documents online that can be instantly accessed from any device with an internet connection. You can also access Google Drive files offline, but we’ll get back to that a little later. Many people are familiar with Google Docs, which uses a format very similar to Microsoft Word to create text documents, but there are other versions of familiar programs available too. Google Slides is used for presentations, much like PowerPoint, while Google Sheets replicates Excel. Each program allows you to select from a range of templates, and contains most of the formatting tools that Microsoft Office users will be familiar with. In addition to these Google-created takes on Office software, there are also plenty of add-ons that you can use to enhance your experience, from speech recognition to image editing tools. Finally, there are Google Drawings for creating new images, and Google Forms, which helps users to create surveys, forms and schedules, the results of which can be represented in tables and diagrams, or exported to Google Sheets. To our minds at BestBackups, one of the best features of Google Drive is the capacity for multiple users to work on the same document at the same time. Whether you’re operating in Docs, Sheets or Slides, this means that whenever one team member makes changes, they can be instantly viewed by everyone else currently working on the document. Unfortunately, this can slow things down a bit if you’ve got lots of people concentrated on one file, but it’s an excellent tool for working collaboratively. The days of losing hard work to a computer crash because you didn’t save frequently enough are over, too – Drive saves changes automatically while you’re working, and allows you to access previous versions should you want to retrieve information that’s since been rewritten. You can choose to access your files offline by installing the Google Drive app in the Chrome browser or from mobile devices running Android and iOS. This will allow you to view and edit your documents offline without losing your progress. On a PC, you can do this directly from Chrome itself, or by choosing Settings in Google Drive. Only files created in native Google Drive formats can be accessed offline, with the exception of Google Forms, which are available online only. Anything created using other programs, including image and Microsoft Office files, can only be viewed when you’re connected to the internet. 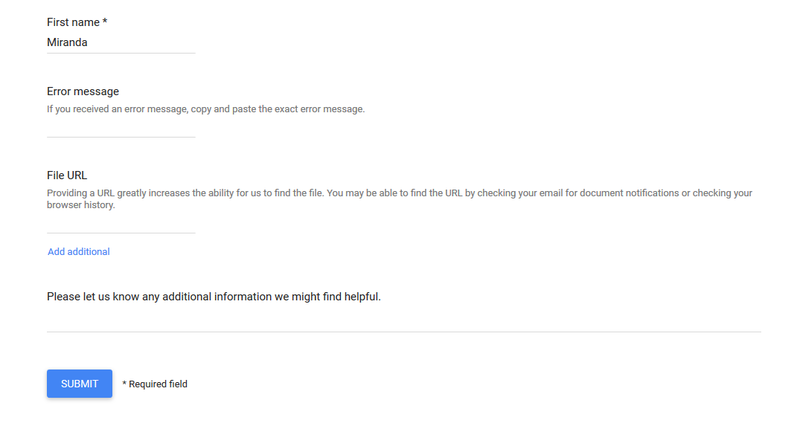 Finding out the particulars of Google Drive’s security is no mean feat – the security page on their website is short on useful information, and privacy doesn’t get a particularly prominent mention in their customer support resources either. After some digging around, however, we did manage to find a few answers hidden in their support forums. So, just how secure is Google Drive? Simply put, not very. Your files are encrypted with SSL while they’re being transferred between your computer and the Drive servers, but that’s about it. In storage, they’re completely unencrypted, meaning that they could theoretically be read by anyone and, by not encrypting them first on your computer, Google can find out anything they want to about the data you’re choosing to backup. On the plus side, there’s no problem with uploading files that have been encrypted in advance, if you don’t mind doing this yourself with a third party program. You can also opt to use 2-factor authentication, which requires you to confirm your identity by phone or text message as well as by password when you sign in. All things considered, Drive might not be the best choice if you’re looking for a program with high-level security features built in, or if you’re uncomfortable with sharing so much of your personal information with Google, although plenty feel that its other features make up for these shortcomings. One notable problem with Google Drive’s customer support is that it’s extremely difficult to submit an enquiry that doesn’t fit into one of their predetermined categories. The Google Drive Help Center is fine, covering basic introductory topics such as how to edit files offline and how to retrieve deleted documents, providing simple video tutorials that give clear step-by-step explanations. Similarly, a good range of subjects are covered in the forums, with a search function helping you to sift through all of the queries. It’s when you start trying to contact support staff directly that problems arise, as you’re given a selection of topics to choose from, with your choice leading to the generation of a specific email enquiry form, live chat or phone call. Once you’ve reached this point, there’s not much room to customize your question, and there’s no ‘Other’ option that gives you a blank canvas. While it is possible to enter whatever additional information you like here, leading questions lead to the vaguely uncomfortable feeling that you are being pushed to only contact them about a specific set of topics. This system is undeniably useful for troubleshooting, as it means that their customer support team will know exactly what you need help with as soon as your request goes through, but if you’re looking for more general information, it can be frustratingly limited. On the plus side, phone support is available 24/7, although the live chat is limited to US working hours. We submitted a support ticket requesting more information on Drive features, but at the time of writing (two weeks later), we still have yet to receive a reply. Their phone service was much more impressive however, with a call back in less than half an hour, and staff operating the live chat were able to answer our questions quickly and with plenty of useful information – although we had to wait several hours before our office was in sync with US opening hours. Google Drive maintains a blog that features detailed posts every few months, showcasing new features and offering company updates. Similar content is posted on their Facebook page, while Twitter is much more active, with over a million followers and regularly tweeted updates; although there’s very little by way of troubleshooting assistance on offer. Setting yourself up with Google Drive is very easy, especially for anyone that already has a Google account, as you can use your existing login details. You can store documents exclusively using the Google Drive website, or download the desktop client, which creates a folder on your computer where you can save any files that you want to backup. All files added to this folder are automatically backed up and synced to your Drive account. As you would expect from Google, Drive’s interface is simple and user-friendly, with familiar features that are easy to navigate. Backing up files is just a matter of uploading them to the Drive website or adding them to your Drive folder, and restoring only requires a click. If you download a folder, its contents will be zipped to speed things up, so you’ll need to extract the files before you can open them on your computer. Don’t worry, though – this is an easy process, and zipping has the advantage of making downloads significantly quicker than average backup transfer speeds. The Google Drive mobile app lets you view and download stored and shared files, as well as backing up images and audio files directly from your mobile device. If you want to create a new document, all of the features of Google Docs, Sheets, and Slides are available too, although you’ll have to download their designated applications to get started. From there, you can also create new content, edit and share existing documents, and make use of mobile extras such as the Research tool, which allows you to copy text and images directly from a Google search without ever leaving the file you’re working on. While this might not sound like much, it comes in very handy on mobile devices that make heavy work of switching between different processes. Google Drive is something of a different beast to most online backup and storage providers, as its focus is as much on having a place to create new documents as it is on keeping existing ones safely stored. With Google Docs, Sheets, Slides and more allowing users to create files in various formats, you get plenty of flexibility – although some people may have concerns about buying into Google’s growing monopolisation of the internet. In addition to this, security measures are pretty thin on the ground, but ease of access and usability are second to none, and the provisions made for collaborative working are excellent. On the whole then, Google Drive is an extremely convenient option for file sharing and new document creation, although it’s unlikely to hold much appeal for people looking to backup large quantities of files and keep them as safe as possible. What do you think of Google Drive? Leave us a comment with your thoughts.